Our Giant Inflatable Water Slide Rental is 18′ tall. A Giant inflatable water slide rental is a great way to make a splash at your next event. They are perfect for birthday parties, block parties, company picnics, church outings and more. With our giant water inflatable slide rental, all age groups will surely have fun. A & S Party Rental has the largest selection of water slide rentals in Dayton and Cincinnati. So, if you are looking for giant water slide rentals near you, then look no further. About the Giant Inflatable water slide: The warm feel of the red and orange fire design will make you feel like you are visiting a tropical Island. With the Giant Inflatable Water Slide Rental, riders will first climb the stairs to reach the sitting platform at the top. From there, prepare for a fast ride down the waves! Riders will go down the water slide and onto a landing pad. Then, there is safety netting across the top to ensure that riders slide down and not try to jump or stand. Not sure if you want wet or dry? No need to worry, our Giant Inflatable water slide rental can also be used as a dry slide! This inflatable dry slide can be used indoors or outdoors at your next event. If you are looking for more water fun, consider adding a slip and slide or our water balloon launching game water wars. 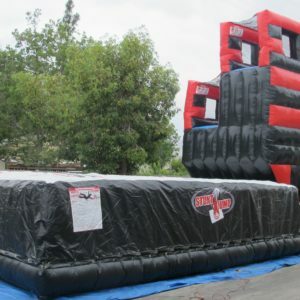 A & S Party Rental offers water slides from 15′ to the gigantic 24′ velocity extreme challenge water slide which is a combination water obstacle course, climbing wall, water slide and a slip and slide! And we also offer the stars and stripes inflatable water slide rental which has two lanes and a curved slide. Whatever type of water inflatable you are looking for we can help you. With over 15 different water inflatables A & S Party Rental has the largest selection in the tristate area. Check out our Facebook page or Youtube Channel for additional information. Or, give us a call in Dayton at 937-885-5454 or Cincinnati at 513-315-9110.